Driving a big-rig is dangerous business, for both truck drivers and drivers of smaller vehicles. Tim O'Hare Law Offices reports that commercial trucks can weigh as much as 80,000 pounds, while the average passenger vehicle maxes out at 3,000 pounds. This weight compounded with the length of trailers, makes big rig trucks difficult to maneuver and stop. Most drivers know that semi-trucks can't stop on a dime. In fact, larger trucks only going 55 miles per hour (slower than most highway speeds) require the length of a football field to come to a complete stop, according to CMV Road Sharing. Unfortunately that doesn't stop some drivers from trying to squeeze their way in front of the truck in an attempt to pass other vehicles. The dashboard cam of a semi-truck caught what happened when an impatient driver tried to pass another truck by trying to squeezing in a tight space. Needless, to say the driver is lucky to have survived the accident. Both semi drivers and drivers of passenger vehicles should be cautious on the road. 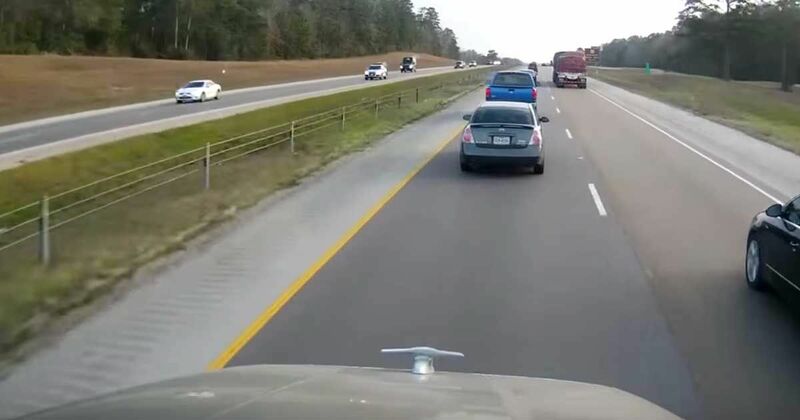 Passenger vehicles should avoid changing lanes too close to a semi-truck, as a blind spot in the front of the truck can make it difficult for the driver to see the car before it's too late. Don Hummer Trucking recommends at least one car length between your car and the truck for every 10 miles you are going (7 car lengths for 75 miles per hour). Make sure to share this story with your friends to help educate other drivers and share your experiences in the comments below.